Family favorite time! This actually is a recipe I thought I blogged LONG ago. I realized I never had and it was what we had for Sunday supper last night! I love sharing our family favorites with you guys. It makes me feel like I am spreading the love for my family to you and yours! Sunday supper is a big deal in our family as most of you already know. I believe strongly in starting the week out with a big family meal, it grounds us, reminds of what is really important in our lives and gives us a chance to talk about the week. We reminisce, laugh, visit, eat great food and spend time with the people we love. Friends OR family alike. I encourage everyone to eat around the table with their children and families. I don't care WHAT you eat, just do it with your kids! I don't care if kids live with one parent or 2, grandparents, aunts and uncles, or foster parents, I believe it teaches them to care about others, cope, problem solve and know they have someone they can trust to talk about anything to. I get busy parents, long hours at work and just wanting some down time. But guess what.....it is a labor of love! Anyway, off of my soapbox. 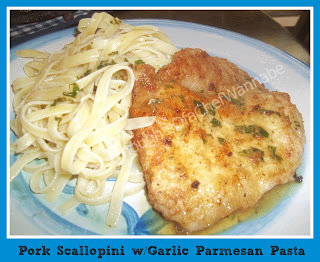 Scallopini can be made with chicken, pork or veal most commonly. I like it best with pork. Scallopini just means it is thin, pounded very thin with a meat mallet. I used a pork tenderloin for this. I almost always do. You know those big huge ones that go on sale somewhere pretty often? I cut them into 3 or 4 pieces and Ziploc those babies into the freezer. Anyway I cut about 1 inch slices and then pounded them out. I used about a 3 lb piece. It made about 8 pieces. It also has a gorgeous wine sauce that gets spooned over the top! Pork loin or boneless chops, pound thin. Mix these dry ingredients up to use as your dredge. Preheat oven to 300 degrees. Heat a skillet up with 1 tbsp of olive oil and 1 tbsp of butter. Dip each piece of pork into the flour mixture, one side and then the other, pressing down to get as much stuck to the pork as possible. Fry 2-3 minutes on each side. Put on a baking sheet in the oven to keep warm. Do this until all pork is fried! DO NOT burn any of it because you will use the drippings and "stuff" left in the pan for your pan sauce! While pan is still hot from frying your pork, deglaze with white wine. Using a wooden paddle spoon or something with a flat edge, scrape up the bits off the bottom while it is bubbling. Add in chicken stock and let simmer uncovered until reduced by half and shut off the heat Add in butter and parsley before serving. There won't be alot, this isn't a gravy, it is just meant to get a spoonful drizzled over the meat. If you feel you want more, it is easy to just increase your ingredients! 1 lb any long pasta. Spaghetti, fettuchini, linguine, angel hair, whatever you choose! Cook pasta according to package directions. While it is draining, in the empty pot, add butter and olive oil, and garlic. Put it back on your warm burner and turn on low. Stir until butter is melted and the "bite" has cooked out of the garlic. Add your pasta back in and toss it with the the mixture. Add in cheese and toss again. Serve with your scallopini! I hope you enjoy this as much as we do!! So glad you liked it! Thank you for taking time to let me know, and thank you for reading!! Just found this - will be making it tonight! Might add a little grated lemon zest to the pork sauce but other than that - it sounds DELISH! thank you! another badass recipe for sure. I think my family will be all about this. Fantastic dish thanks! Keep them coming. I made this tonight and it was so good! Thank you for the recipes. We added steamed broccoli and drank the remaining pinot grigio wine. I must say a great date night dinner. You should try it. I am so glad you liked it and steamed broccoli? YES!! I appreciate that you made it and then took time to let me know how you like it. Thank you for your kindness and for being part of the Chefwannabe fam!